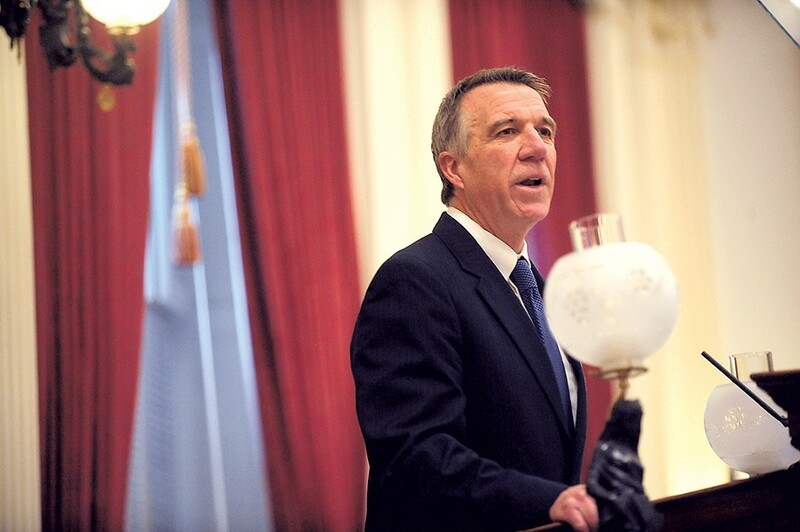 As a candidate for governor, Phil Scott often bemoaned how Vermont's education costs keep rising despite a declining number of students. The Republican talked about how Vermont employers have trouble finding qualified workers. He spoke about how parents need better access to quality, affordable childcare. But during a year on the campaign trail, Scott never put the three ideas together. He never told voters that if he became governor, he would take money from the K-12 school system to increase spending on early childhood programs and higher education. Three weeks after taking office this month, he pitched that plan as part of his first proposed state budget. "I'd say that it developed all the way through the campaign but really started getting more specific ... the day after the election," Scott said Friday in an interview with Seven Days. 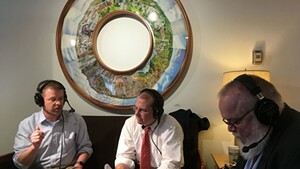 Scott's plan surprised many people, including legislators in his own party. It is, critics argue, full of legal and fiscal flaws and is logistically impossible to implement immediately. Many think the ever-practical Scott must realize that. 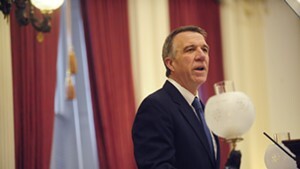 This was a self-described "bold" plan coming from a governor who ran for office on the argument that Vermont had seen too many bold plans under former governor Peter Shumlin. "I'm disappointed," said Rep. Cynthia Browning (D-Arlington), a member of the House Ways and Means Committee who often votes with Republicans on tax policy. "I think we've got some kind of chess game, and that's not the behavior I expected." Scott balanced his 2018 budget plan by shifting $118 million in general fund expenses to the education fund. His proposal would further require school districts to freeze their budgets and mandate that all teachers pay at least 20 percent of their health insurance premiums — up from 15 percent in many cases. He projects the freeze and the health package would save $51 million next year. 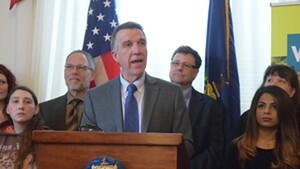 To give school boards time to rewrite their budgets, Scott asked the legislature to move school budget votes from the traditional Town Meeting Day in March to May. For that to happen, he needs both the House and Senate to sign off on the idea by this Friday. 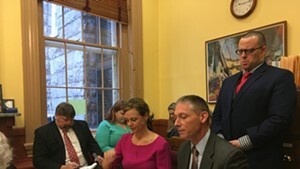 "It's an almost impossible position that the Senate's in, to consider a tectonic shift in the way we fund education in, I think, about eight days," said Senate President Pro Tempore Tim Ashe (D/P-Chittenden). Scott launched a logistical long shot, without having built a coalition of support. Even Republican legislators have been openly rolling their eyes. A week after Scott's budget address, the Senate Education Committee steered Scott's plan toward an early demise. In a straw poll, the panel voted unanimously Tuesday against moving school budget votes to May. Two Republicans, Sens. Kevin Mullin (R-Rutland) and Joe Benning (R-Caledonia), joined four Democrats in casting no votes. Can this brand-new governor and a legislature with two new leaders find common ground to write a mutually agreeable state budget? History provides a reminder. Eight years ago, Republican governor Jim Douglas started a session with a similar-sounding proposal to freeze school spending. Legislators rejected it. Douglas vetoed the budget they proposed in response. They overrode his veto. Are this Republican governor and Democratic legislature headed in the same direction? "I don't know," House Speaker Mitzi Johnson (D-South Hero) said Thursday, a flat acknowledgement that she, Scott and Ashe are still learning each other's leadership styles. "We will certainly work with them." Scott sounded the same tone Friday, suggesting he fully expects his plan to be modified. All legislators have to do is agree with him on the underlying ideas, he said. 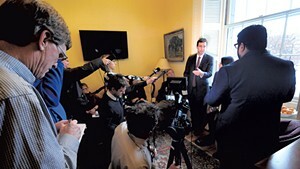 "Anything that's introduced in the legislature is under a lot of scrutiny, with many, many changes," Scott said. "I'm not saying it's this way or no way." Though he didn't spell this idea out in detail during the campaign, Vermonters shouldn't be surprised by what he came up with, Scott said Friday. "I'd said consistently we're spending too much in K-12. I think most voters appreciated that and understood that," he said. The plan emerged, he said, after his budget advisory committee convened in November to start crafting his first state budget. With a $70 million gap between anticipated revenues and projected costs, that task was harder than he expected, he said. Scott turned for help to several former Douglas staffers, who produced an education funding idea that borrows from Douglas' 2009 proposal. Those advisers included former Douglas budget writers Neale Lunderville and Jim Reardon. Other Douglas hands playing key roles were Scott's administration secretary, Susanne Young; his chief of staff, Jason Gibbs; and his transition team leader, Tim Hayward. Education Secretary Rebecca Holcombe was not involved in crafting the education funding ideas, according to Scott. "This isn't her plan," he said. Across Vermont, Scott's proposal is creating real-world challenges. A day after hearing about it, Rep. Kevin "Coach" Christie (D-Hartford) returned home for a meeting of the Hartford School Board, on which he serves. The panel was scheduled to move forward with its school budget proposal in preparation for the March 7 Town Meeting Day vote. Christie's fellow school board members discussed waiting until they heard more about Scott's proposal. But at his urging they instead signed off on the plan they'd started in September, which increases spending just less than 3 percent. The level-funding that Scott wants would have required a $1 million cut and layoffs, Christie said. 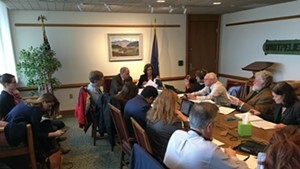 School boards around the state are in similar spots, said Nicole Mace, executive director of the Vermont School Boards Association. State law requires them to publish their budgets by February 5 for the March 7 vote. Logistics are just one stumbling block. Fifty-seven school districts are also planning to vote March 7 on consolidation plans required under 2015 legislation, Johnson said. Those mergers are happening at a faster clip than expected, she said, and should be allowed to play out before the state sends new mandates to school communities. Scott's plan also raises constitutional questions, because it would allow districts that can't reach a level-funded budget next year to raise up to 5 percent more from local property tax rolls. Ashe said that appears to violate the 1997 Vermont Supreme Court decision Brigham v. State, which ruled that schools across the state must have equal funding opportunities. 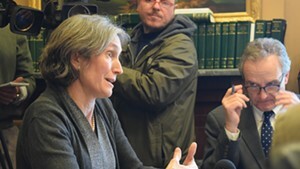 The governor said he doesn't think his plan violates Brigham, though he acknowledged that others might disagree. Scott has dismissed opposition coming from the Democratic legislature, the teachers' union and the Vermont School Boards Association as predictable. On the streets, he hears another message — frustration over rising taxes, he said. "I don't hear the pushback," he said. "I have school board members that have written, that say, 'Thank you ... We need a backstop. We need something to help us to make these tough decisions.'" But opposition to his plan within the Statehouse transcends political lines. At Scott's request, three Rutland County Republican senators sponsored a bill that would enact most of the changes he seeks. But even they are not enthusiastic cheerleaders. "It's our way, as a legislature, to begin the conversation," said Sen. Brian Collamore (R-Rutland). "Is it the only way forward? No." When no similar bill immediately emerged in the House, lawmakers speculated that Scott couldn't find a sponsor. This week, Reps. Corey Parent (R-St. Albans) and Job Tate (R-Mendon) introduced a bill that would move school budget votes to May but does not include the other changes. Parent said that's because this is the part that needs to pass now. "I support the end goal," he said. It appears that Scott's staff ran into resistance in the House. Rep. Adam Greshin (I-Warren) said he was asked to sponsor the measure but declined. "I was looking for more details before I would put my name to it," he said. Greshin said he agrees with some of the ideas, such as bringing teachers' benefits in line with those of other public-sector workers. But he's also a Warren School Board member who knows how much work boards have already put into their 2017-18 budgets. "You're asking them to go back to the drawing board," he said. Republican legislators who could have helped build a coalition said they were not asked. Instead, some were questioning the plan last week. 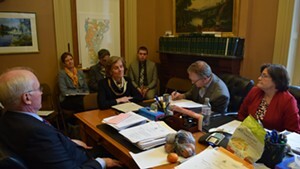 During a House Ways and Means discussion, Rep. Fred Baser (R-Bristol) joined in the overall dismissive tone. "This is price control," he said. "It doesn't work." Scott appears unfazed. He said he's willing to work with legislators on alternative plans — as long as they agree with a few principles: that higher education and childcare need more funding and higher taxes aren't the answer. "If we agree to those simple things, then let's figure out how to get there," he said. "Getting there" is the hard part. Ashe and Johnson both said they don't want to raise property taxes. They agree that higher education and childcare need a boost, though they're not looking to siphon the funds from the K-12 system. "There's plenty of options for reducing costs [of K-12 education]," Ashe said. "The problem is doing it thoughtfully." He argued, for example, that Scott's across-the-board spending freeze unfairly punishes those who have been managing their budgets. Sharpe, the House Education Committee chair, said he shares the governor's interest in expanding technical education programs. "The governor talked about his ability to work across the aisle," Sharpe said, yet his staff declined to meet with the chair before the budget address to discuss ideas. Johnson said she agrees with Scott that this year presents an opportunity to find health care savings, as all teacher contracts in the state are up for renewal, and teachers begin a new health plan the following year. Mace said the school boards association has a teacher contract proposal that would save $26 million in health care costs next year — nearly twice what Scott's plan would save. "Generally, the reaction among school boards is, 'Gov. Scott, we share your goals. The timing of this proposal does not work. Some of the specifics do not work, but we want to work with you,'" she said. After a week of trying, she landed a meeting this week with the governor's staff.